Individual health insurance is one of the vital issues underlying the ongoing health care debate. According to the U.S. Census Bureau more than 46.34 million people in the United States were uninsured in 2008. And the uninsured rate is growing, standing at 15.4% in 2008, up from 13.7% in 2000. Contrary to some perceptions, the percentage of uninsured people living outside of metropolitan statistical areas (MSAs) is actually slightly smaller than it is within MSAs. Census data indicate 15.2% of U.S. residents living outside of MSAs were without health insurance in 2008 while 15.4% within MSAs were uninsured. If one looks simply at metro-nonmetro uninsured rates, this suggests that there may be no real “rural” dimension of the health insurance issue. After all, people outside of MSAs are actually somewhat more likely to have health insurance. But these aggregate statistics mask important demographic differences between MSAs and outlying regions that turn out to have very important implications in terms of insurance coverage. Specifically, the fact that rural residents are older on average than their metro counterparts means that the “type” of health insurance becomes a central concept. In particular, there is a clear distinction between public and private insurance types. Medicare is the most influential public insurance program,with Medicaid and Children’s Health Insurance Program (CHIP) being the other important public programs. In practice, nearly all retirees 65 and older are eligible for Medicare. As a consequence, more than 98% of all people 65 years or older have some type of health insurance coverage. Returning to the fact that the proportion of the population 65+ years of age outside of MSAs is higher than within MSAs, a closer look at private insurance—for example, employer based and self-insurance—is necessary to determine any potential spatial differences in health insurance rates. When excluding the population 65+ years of age, important differences in metro/nonmetro health insurance rates emerge. According to the 2007 U.S. Department of Health and Human Services Medical Expenditure Panel Survey (MEPS), 69.9% of MSA residents less than 65 years of age had some type of private insurance the year before, whereas the rate was 65.5% for nonmetro residents. In fact, the proportion of people with employer based coverage is declining over time in both metro and nonmetro areas and employer based health insurance is less common outside of metropolitan areas. As health care policies are being reformed, it is important to understand the link between the lower insurance rates for employer based insurance outside metro areas and the economies of metro and rural areas. Although a number of important factors are at play, there are two primary reasons. First, the costs of providing health insurance at the firm level are subject to increasing returns to scale, and metro employers tend to be larger on average than their nonmetro counterparts. Second, the likelihood an individual has employer sponsored health insurance increases with education, and metro employers tend to be more human capital intensive than nonmetro ones. These facts have important policy implications as they suggest employment based health insurance is never going to provide anywhere near universal coverage in the current environment, even more so in rural areas. Indeed, as health cost increases continue to outpace inflation, employer supported health insurance plans are likely to become increasingly scarce, especially in lower-skilled jobs. Consequently, significant policy reform, such as through insurance exchanges, is essential if a substantial increase in health insurance coverage is desired. In the United States, employer based health insurance is far and away the primary means by which working age people pay for their health care. This system has auspicious origins. In the early years of World War II, businesses offered health insurance to recruit workers whose wages were capped by the federal government. After the war, the model’s reach expanded, as employers recognized the benefits of a healthy workforce far outweighed the costs of providing health insurance. For decades following its inception, the employer-sponsored model worked quite well. A large majority of businesses provided health insurance and most workers were covered. Over the past 20 years, however, medical costs have soared. Research has led to great improvements in technology and medical procedures, allowing people to live longer, healthier lives. This effect has been compounded by dramatic innovations in drug research. Yet all of this progress has come at tremendous financial cost. In the United States, these costs are borne largely in the “third-payer” insurance market. The effects of rapidly escalating insurance costs resonate across the economy. Several recent surveys show that many employers are more concerned about rising health insurance costs than they are about wage increases. Meanwhile, the declining influence of labor unions has weakened the bargaining position of many workers, and union workers are much more likely to be insured than nonunion workers. Employers are implementing various measures to deal with higher insurance premiums, including: increasing deductibles, co-pays and employee contributions; and decreasing coverage. More dramatic steps involve eliminating dependent coverage, or, in some cases, completely eliminating health insurance benefits. The upshot is that many workers are paying more for their health insurance, taking home less pay, or even losing their coverage completely. How substantial is this trend? According to MEPS data, about 74.3% of U.S. residents between the ages of 25 and 64 were covered by private health insurance in 2006. In 2000, the rate was 79.2%. These temporal differences carry over when comparing metro and nonmetro areas. In 2006, the private insurance rates for metro and nonmetro residents 25-64 years old stood at 74.8% and 71.3%, respectively. This is notably lower than 2000, when 79.6% of the metro population between the ages of 25 and 64 had employment based insurance, while 76.9% on their nonmetro compatriots did. The provision of employment based insurance makes sense economically. In the United States, health insurance benefits, unlike wages, are generally not taxed on either the employer or the worker side. Not surprisingly, both parties often prefer health insurance to equivalent wage compensation. Employees see benefits beyond lower tax bills. Because of risk sharing, an individual’s out-of-pocket insurance costs are typically lower with employer-sponsored plans than they would be if they had to pay for comparable coverage themselves. The cost advantages arise because the risk of any individual becoming very sick is spread out over a comparatively large number of coworkers. One important consequence of risk sharing is that as employer size increases, average costs per worker tend to decrease. Because per employee insurance costs are lower for larger firms, it is reasonable to expect that larger firms will more likely insure their workers than smaller ones, all else equal. The evidence seems to bear this out. MEPS data show that larger firms are much more likely to provide health insurance than smaller ones. For example, nearly 97% of all firms with more than 50 employees offered some type of health insurance benefits in 2008. By comparison only 43.2% of firms with fewer than 50 workers did. Table 1 shows that the likelihood of insurance increases as firm size increases. Only 35.6% of firms with fewer than 10 employees offered health insurance in 2008, while 99% of the largest firms with 1000 or more employees did. Because nonmetro firms are smaller on average than metro firms, differences in metro/nonmetro firm size might explain differences in employer-sponsored coverage. According to 2006 County Business Patterns data, about 19% of employment in nonmetropolitan areas was concentrated in establishments with 20 or fewer workers. By comparison, about 17.5% of metropolitan workers were employed by such establishments. Establishments with fewer than 10 workers, which are least likely to offer health insurance benefits, provide 11.4% of all jobs outside of MSAs, a full percentage point higher than the same size establishment share of total metropolitan employment. While relatively larger employers in metro areas may explain some of the difference in employment-based insurance coverage between metro and nonmetro areas, the fact is that firm size distributions are not all that dissimilar between the two regions, suggesting other factors are likely at work. One competing explanation is metro/nonmetro differences in human capital. Skill differences, as indicated by a job’s educational requirements, are the main reason metro workers are more likely to have employment based insurance than nonmetro workers. Education’s central role in individual well-being is beyond debate. There is overwhelming evidence that people with a two-year or four-year college degree are much more likely to have higher incomes, and much less likely to be unemployed or live in poverty, and that these differences have grown over time. Further, U.S. Census data also reveal that the college-educated are much more likely to have employer sponsored health insurance than those without a post-secondary degree. According to the Current Population Survey, 82% of U.S. residents between the ages of 25 and 64 with at least a bachelor’s degree had employer based health insurance in 2008, whereas the rate was just 59.7% for those with only a high school degree or its equivalent . Only 31.1% of U.S. residents between the ages of 25 and 64 without a high school degree had employer-based insurance last year. Data from the 2006-08 American Community Survey shows a wide discrepancy in educational attainment between residents in MSAs and in areas outside of MSAs. Specifically, 29% of MSA residents over the age of 25 have at least a bachelor’s degree, while the rate is 17% outside of MSAs. Conversely, 56% of non MSA residents have at most a high school degree or its equivalent, while the MSA rate is 45%. Given the strong correlation between wages and health insurance coverage, this is not a profound discovery, but it does have profound policy implications. Namely, as high level human capital increasingly concentrates in the nation’s metropolitan areas, it is likely that the gap in metro/nonmetro employment based health insurance rates will increase. While debate on government’s role in health insurance provision has been raging for decades, the significant downturn in the U.S. economy over the past 14 months has allowed the issue to take on even greater prominence. With more than 10% of the labor force without a job, the historical ties between work and insurance are under intensified scrutiny. After the dust settles, the role of employer based insurance could be greatly different than it is today. Tax credits for small businesses are one option forwarded by President Obama that would enhance the availability of employment based insurance. Details may be found at the U.S. Dept. of Health and Human Services (U.S. Dept. of Health and Human Services, 2009) website. The size of this credit will likely determine whether or not employers take advantage of it. A recent small business survey in rural Pennsylvania found that employer cost was overwhelmingly the most important reason health insurance was not offered, cited by 87% of nonoffering respondents (Shields, Mushinski, and Davis, forthcoming). And the costs keep going up. 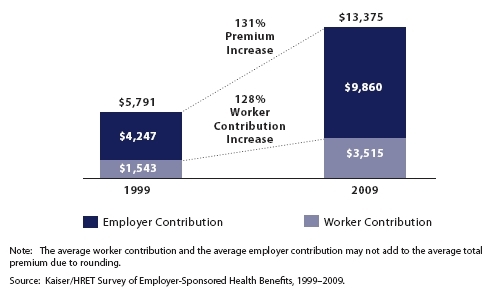 According to the Employer Health Benefit Survey (Kaiser Foundation, 2009), the average annual health insurance premium and worker contribution for family coverage was $13,375 in 2009, up 131% from 10 years earlier. On average, employers paid $9,860 of this. As a reference point, a recent study by ERS found nonmetro wages and salaries averaged about $31,300 in 2006 (Kusmin, Gibbs, and Parker, 2008). Given that lower wage workers are less likely to have health insurance, it is not difficult to imagine new mandatory health insurance benefits driving up compensation costs 50% or more for employees currently not offered health insurance. One likely consequence would be continued stagnation of wages, especially for low income workers, with rising insurance premiums being the alternative form of any real increases in compensation. An important rural economic development consequence would be a diminished competitive position for businesses competing in global markets. When all is said and done, however, tax credits will likely have limited impacts in reversing the decline in employer based insurance coverage. In fact, the harsh reality is that incremental changes will never provide employer-based health insurance for all workers. It’s just too expensive. These facts point to a grim future for employment based insurance, especially in rural areas. Costs are increasingly rapidly, resulting in an increase in the numbers of uninsured. A staggering 46.34 million U.S. residents were without health insurance last year. And of those workers who do participate in employment based programs, a higher education degree is increasingly important in determining who gets covered. Kaiser Foundation (2009). Employer Health Benefit Survey. Available online: (http://ehbs.kff.org/pdf/2009/7937.pdf). Kusmin, L, R. Gibbs and T. Parker (2008). Education’s Role in the Metro-Nonmetro Earnings Divide, Amber Waves Vol. 6 (1) Economic Research Service, U.S.Dept. of Agriculture. Available online: (http://www.ers.usda.gov/AmberWaves/February08/Features/EducationRole.htm). Shields, M., Mushinski, D. and Davis, L. (Forthcoming, 2010). Provision of Employer-Sponsored Health Insurance in Small Businesses: Does Rural Matter? Review of Regional Studies. U.S. Dept. of Health and Human Services (2009). HealthReform.gov. Available online: (http://www.healthreform.gov). Martin Shields (martin.shields@colostate.edu) is Associate Professor, Department of Economics, Colorado State University.